Introduction - Brethren, firstly let me acknowledge that I have been somewhat sluggish in updating this site as the New Year started but I am pleased to note divisional activity is fully active again in 2019. I trust you have all had a good break from normal duties during the festive and New Zealand summer holiday period. I have enjoyed the start of my Masonic year with attendances in the Royal Arch Grand Convocation held in Hamilton, when I was able to join with the delegation supporting the Grand Masters reception. Just last week I had the further special privilege of being at the lodge of Peace, Divisional Scholarship presentation evening. It was another fantastic opportunity to meet a group of talented and dedicated young people focused on progressing their careers and making a difference to the world we live in. We have been saddened to hear news the wife of our previous Divisional Grand Master RW Bro Eddie Eeles (Judith) has been ill and in hospital. It seems it will take Judith a good bit of time to recover from her surgery and she will need much support from Eddie. Strategic Plan - I am sure all of you would have by now seen the first release of material supporting the revised National Strategic Plan and I hope you are pleased with the format and the approach envisaged in the material. The plan provides for a focus of direction, in particular, continuing the theme of “Speak up for Freemasonry” and material that will guide districts, lodges and especially each and every one of us as individuals to look at what we can do to advance freemasonry. The immediate past year has given us renewed enthusiasm with greater numbers of men wanting to join our fraternity and we now need to meet the challenge of making sure they quickly feel part of freemasonry and enjoy their participation. I am sure that by embracing the plan it will help us do that. Lodge Te Papa Installation - At our divisional team meetings I continue to encourage inter-district connections and we had the opportunity this month to assemble all five District Grand Masters and myself in Tauranga at lodge Te Papa’s installation. It was a unique experience and greatly enjoyed by all the Divisional team and Grand Lodge officers in attendance. I thank the District Grand Master VW Bro Paul Hendricksen for the invitation and to lodge Te Papa for their hospitality. Nominations for Active Office 2019 – 2022 - At the closing date of 22 March 2019 I have received some 87 nominations for active roles during the next electoral period, and for promotion or Grand Lodge recognition. The task of election and selection now begins and lodges will be advised of the circumstances and outcomes in accordance with the previous National office circular dated 18 January 2019. District Seminars - Following the decision from last year’s remits to change the sequencing of Divisional Conferences, I decided in this division, with the support of the District Grand Masters, to arrange three district seminars. The first of these meetings will be held on Sunday, 31 March 2019 at the Auckland Masonic Centre, 181 khyber Pass Road - to be followed by the Northland seminar on Saturday the 4th of May 2019 and finally the Waikato / Bay of Plenty districts in Hamilton on Saturday, 11 May 2019. I trust you will make an effort to attend one of the seminars where I will be presenting the 2018 Annual Report and Financial results, and in particular, making time to discuss the new strategic plan. Le Quesnoy Museum - The national charity project to raise funds for the Le Quesnoy Museum is still open and a number of lodges throughout this division have or are in the process of raising funds to support the project. If you need any further information about the project please contact RW Bro Neil Ingram or our Grand Lecturer, VW Bro Mark Hall. Conclusion – The month of April starts with an official visit by the Grand Master to Lodge Ponsonby (54) on the occasion of W Bro Sonny Bedder’s 50 year badge presentation and followed the next evening with two 60 year bars being presented to W Bro Alex Wilson and W Bro Ray Potter at Lodge Arawhaiti. The year ahead will be an interesting time as the new officers to be installed at the Grand Installation in Wellington are advised and the transition of responsibility begins. 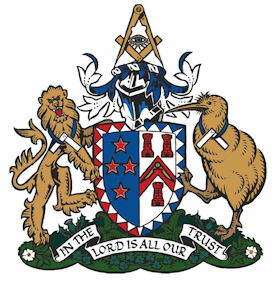 I hope you will all be thinking about attending the Grand Installation which is the time we get together to celebrate Freemasonry in New Zealand in a very public way. They are wonderful occasions, and while I acknowledge there is a cost, it is the one time every three years that we have the opportunity to celebrate with our new active teams and to interact with our brethren from all over New Zealand.